Every once in a while, I have the urge to declutter and cleanse. Every part of my life- from my make up bag to the pantry as well as the fridge and freezer. There is nothing better than opening your wardrobe to find all your clothes arranged neatly according to color. Or opening the kitchen cupboard and staring in awe at all the jars labeled alphabetically. Yes, you could say I am rather obsessed with being a clean freak- everything must be orderly and organised. This year, Maryam joined in my spring cleaning spree. Together, we went through her toys and systematically sorted out what she loves to play with and what is currently tossed to one side. As I kept putting more and mroe toys to the 'chairty' pile, every time I turned my head the pile became smaller and smaller. She would putting the toys back saying she still 'needed' them. In the end, we collectively agreed on what toys she would be giving away to those less fortunate. It was a great activity to do together, to make her realise the importance of charity, of giving, of sharing. Yet, it also made me more conscious of how wasteful we can be. Perhaps the best part of cleaning sprees is that moment of discovery. When you find hidden money in the sofa, when you stumble upon an outfit that is almost as good as new, when leftover tart dough is unearthed from the depths of your freezer. And that is exactly how this tart came to be. 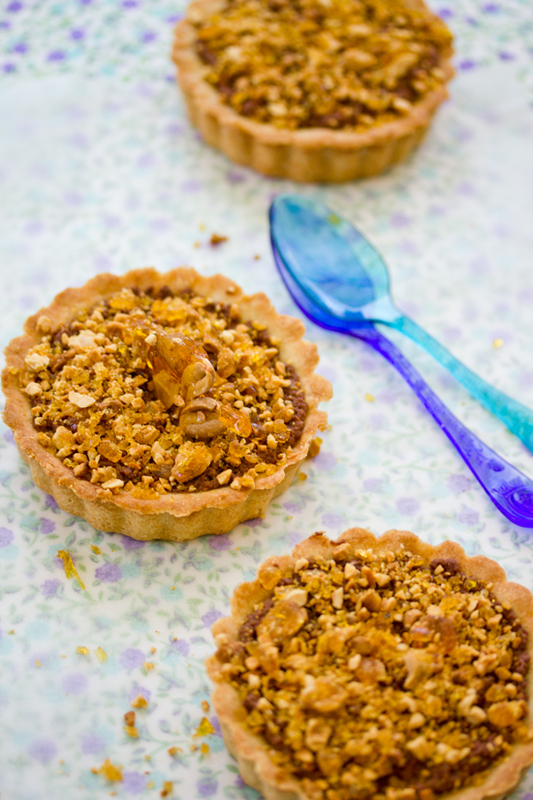 I had made this tart dough a while back when I made these pear crumble tarts for Mowie's magazine. 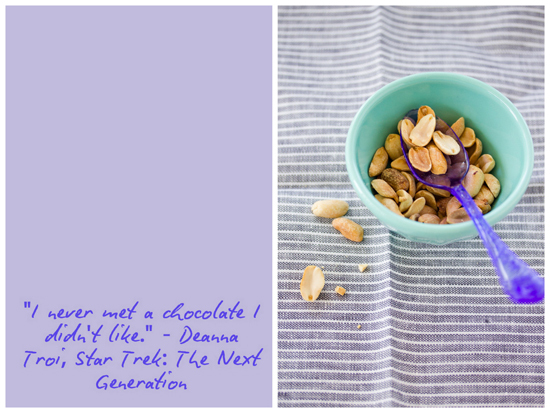 I decided to top them with smooth and velvety chocolate mousse and a kiss of peanut butter. Then you bite into it and there is a crackling explosion in your mouth. It's the crackle of peanut praline brittle. It was the icing on the cake after a hard day of cleaning. Me and Maryam quietly ate one each at the end of the day, a twinkle of excitement in both our eyes. She- because she chanced upon a singing stuffed toy in her toy box. I- because I discovered a long lost yellow dress, perfect for spring. To make tart bases, cream the butter and sugar using the paddle attachment on your mixer until light and fluffy. Add the egg and beat well. Stir in 300 grams of flour. If the mixture doesn't clean the sides of the bowl, keep adding more flour a tablespoon at a time until it does. Shape the dough into a disc and wrap in cling film. Refrigerate for 30 minutes. Preheat the oven to 180 degrees Centigrade. Grease your tart bases and roll out the tart dough using minimal flour to a 1/4 inch thickness. Fill the tart bases and cut off any excess (can be stored in the freezer). 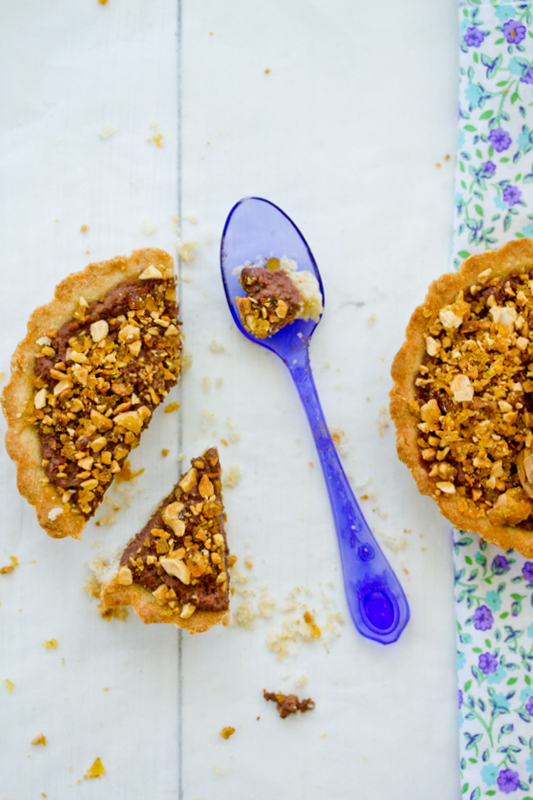 Pierce the tarts with a fork and bake for approximately 10 minutes. Remove from the oven and cool. 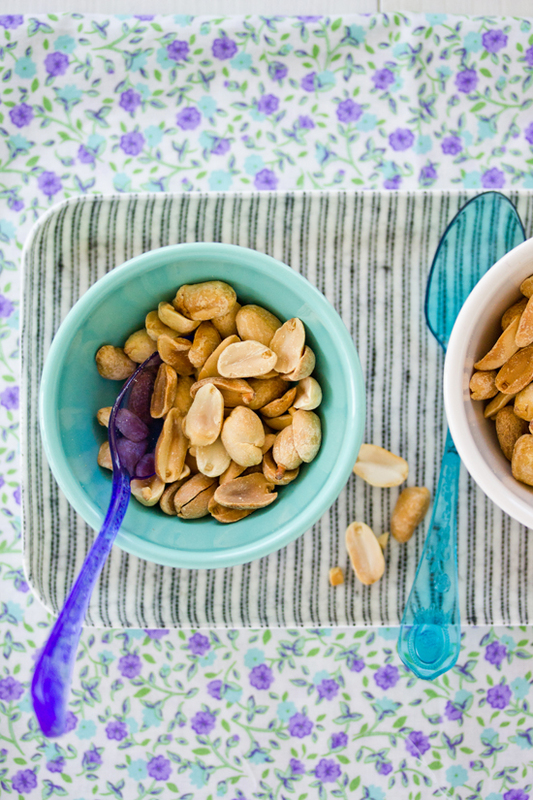 Place the peanuts on baking paper placed over a baking tray. To make the peanut praline brittle, mix the sugar and water in a heavy bottom saucepan and bring to the boil (do NOT stir but swirl the pan). Boil for a minute and reduce the heat. Simmer mixture until it turns a golden color. Quickly pour the syrup over the peanuts and tilt the tray to coat all the peanuts. Work quickly as the toffee sets very quickly. Refrigerate until completely cool. Place in a food processor and pulse a few times. To make the mousse, whip the cream to soft peaks. Heat chocolate and peanut butter until melted and fully incorporated over a bain marie (can use a microwave). Cool completely and quickly fold into the whipped cream. 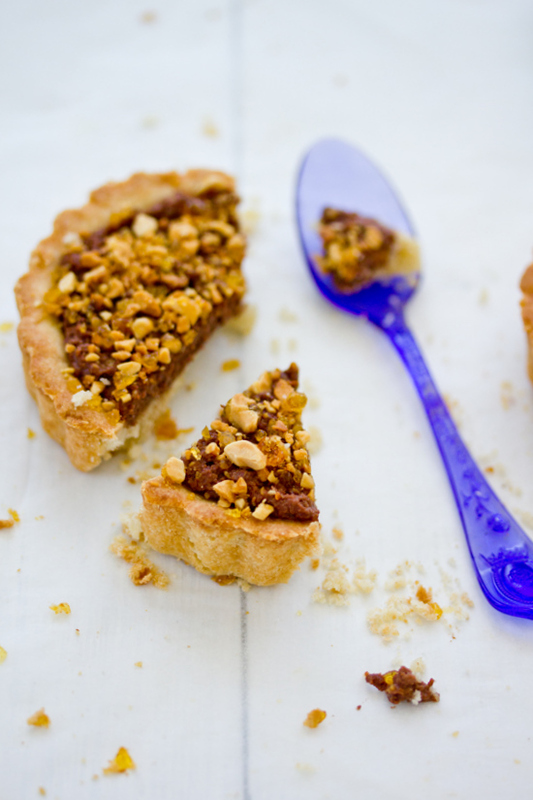 Spread into the cooled tart bases and sprinkle with peanut praline brittle. Can serve as is or refrigerate and serve cold. Makes 6 tarts. Extra dough can be frozen. ooooh that brittle looks fabulous Sukaina!!! OMG, I am speechless in front of so much scrumptiousness! Those are just to die for. The tart looks amazing... wonderful pictures. What a great idea!!! peanut butter brittle on top - delicious. That's why i love your blog. you one pf my favourite inspirations to get my food photography better and better. Keep up with the wonderful blogging! Couldn't relate better on your starting lines.. I go through phases of accumulation followed by feeling miserable and craving to cleanse/declutter/simplify/re-organize.. When it actually happens, it is so liberating - a big relief both visually as well as mentally! You have a reason to celebrate indeed! 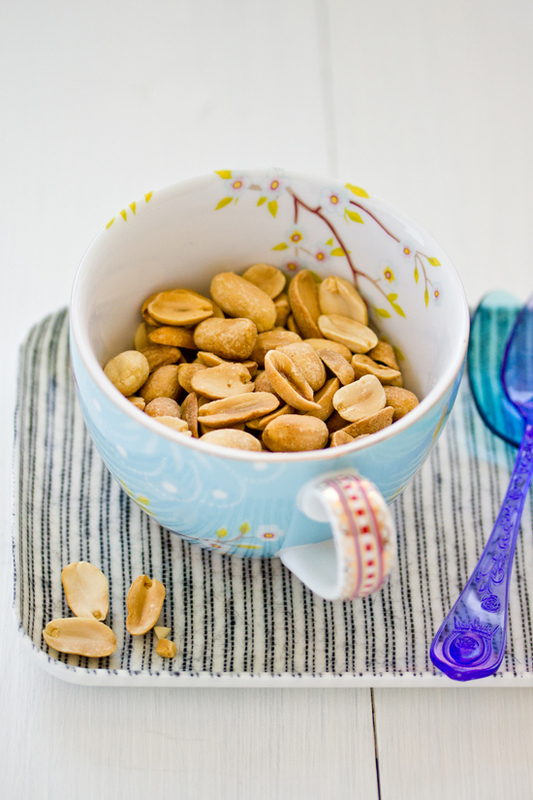 Picture of that pretty cup with peanuts is too cute.. These look decadent. I'm totally starting to get the spring cleaning itch too... just waiting for a nice weekend day to raid the cupboards and closets! Your pictures are really pretty ! Yum and gulp... no more words! this looks so beautiful! such a wonderful post! I'm so glad you posted this before the weekend, now I can make these for Saturday supper! Chocolate and peanut is one of my favourite combinations and the brittle just takes it to another level. Gorgeous. Now that's the way to celebrate a hard days worth of cleaning! Dying for a bite and your photography makes it all the more better! Supremely decadent! 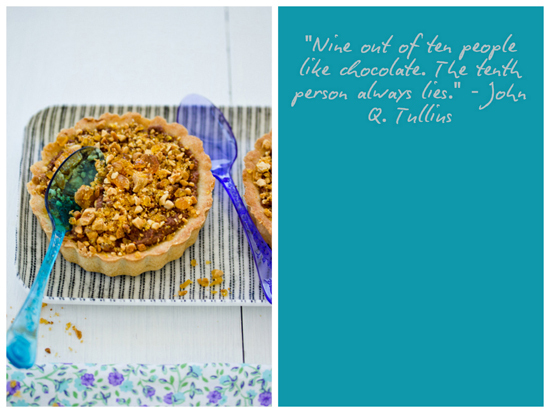 This flavor combination is classic for a reason and I love how you've arranged it in this tart. Very appealing texture and colors too! im adding this to my "recipes to make" list! Gorgeous and delicous. I love your photography-just stunning! ps-i have the same tray. too bad don't live close we could share props and save some cost there. lol. Oooo, love all your serving pieces. So pretty! Um, wow! That's about all I can say. This combines some of my favourite things all in one! what a lovely, thoughtful post! I so love a declutter too, although I never seem to find money sadly. It is such a wonderful fresh feeling, and I am sure it is one of the most intrinsic human instincts - or even animal instincts. These tarts look absolutely amazing, I wish I could whizz one down the cyber wires and have a taste. 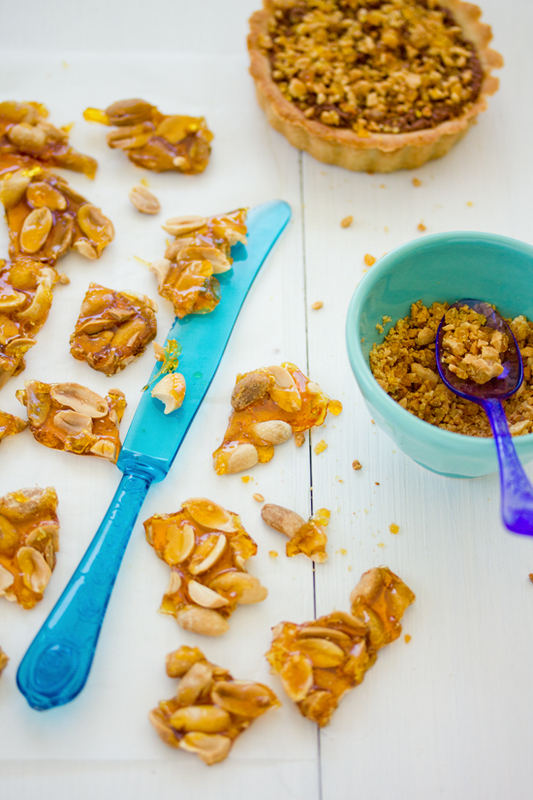 Love the Peanut Praline brittle! Yum! look so delicious. 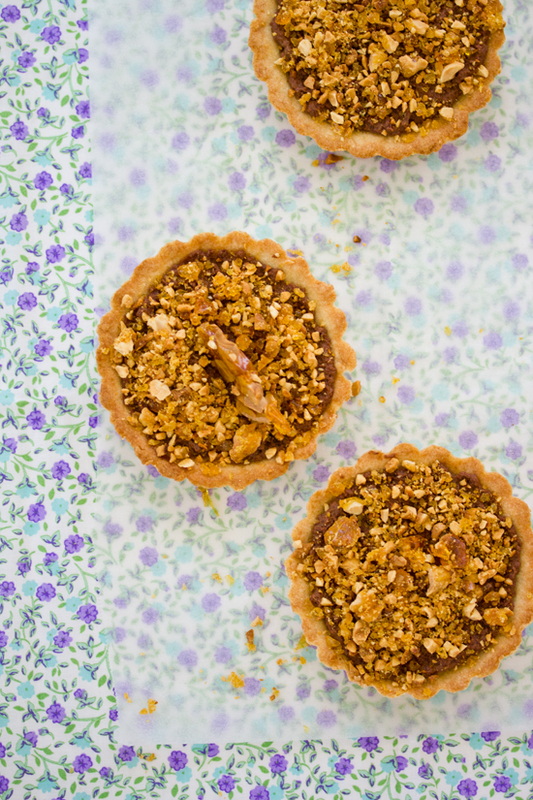 Ive just discovered your blog via flickr and Im in love :) I love idea of these mini tarts and for sure I will make them. Can I please have a piece of these tarts?? They look awesome! That so rich tarts, your photographies always are the most beautiful! 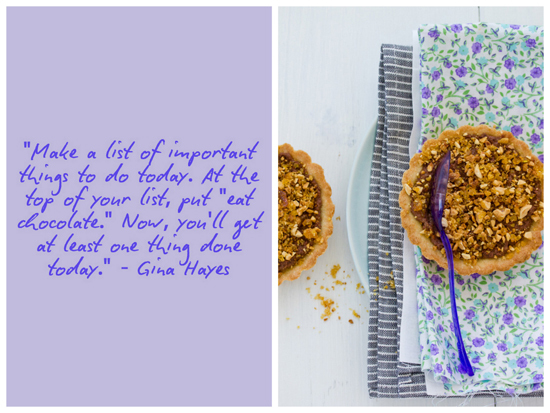 Thanks for this post on chocolate peanut butter tarts with peanut praline brittle. They look wonderful. I am not much fond of peanut butter,however I cannot but marvel and crave these just seeing the photographs. And loving the brittles very very much. I love your pies ! great pictures, congratulations ! The tart looks so great!! Thank you for sharing the recipe!